The 49ers have allowed 31 passing touchdowns this season, ranking 28th in the league. They play the Rams in Week 17. The 49ers haven't forced a turnover in the last six games. They play the Bears in Week 16. 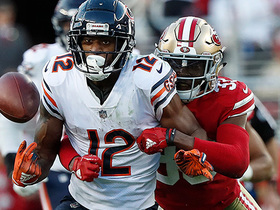 The 49ers rank 12th in the league by allowing 107.8 rushing yards per game. They play the Seahawks in Week 15. The 49ers haven't forced a turnover in four weeks. They play the Broncos in Week 14. The 49ers have allowed 24 or more points in nine of 11 games this year. They play the Seahawks in Week 13. The 49ers have forced a league-low five turnovers this season. They play the Buccaneers in Week 12. 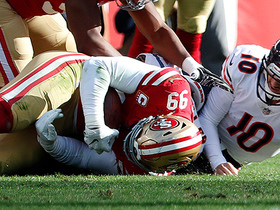 The 49ers have forced just two turnovers in the last five games. They'll play the Giants in Week 10. 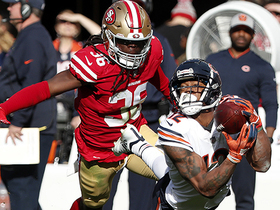 The 49ers rank second-worst in the league with just two interceptions. They play the Raiders in Week 9. The 49ers allowed 28 points and didn't force a turnover in their game against the Cardinals three weeks ago. The two sides will meet again Sunday. The 49ers have allowed at least 24 points in each game this season and forced just three total turnovers. They'll play the Rams in Week 7. Analysis: The Rams have one of the highest-powered offenses in the league, ranking first in the league with 464.3 total yards per game and third with 32.7 points per game. 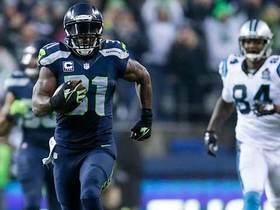 They leave little for opposing defenses to harvest from, either, turning the ball over just six times (five interceptions, one fumble) this season. That leaves a low floor for a 49ers squad that hasn't performed well defensively this season. The potential isn't here this week for San Francisco D/ST, and it may not be for a while. The 49ers have allowed opponents to score touchdowns on 63.2 percent of their red-zone trips, ranking 22nd in the league in that category. They'll take on the Packers in Green Bay in Week 6. CB Richard Sherman (calf) is unlikely to play Week 5 against the Cardinals. 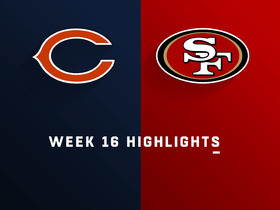 The 49ers lost 38-27 to the Chiefs in Week 3. They'll play the Chargers in Week 4. 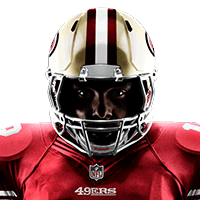 The 49ers beat the Lions 30-27 in Week 2. They'll play the Chiefs in Week 3. FS Adrian Colbert is dealing with a shoulder injury ahead of Sunday's game against the Rams. 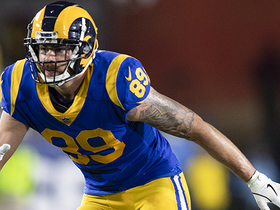 Analysis: The Rams lit up the 49ers in Week 3 for 41 points, but that was back when Colbert was just a special teams player. Also, that was when RB Todd Gurley and QB Jared Goff were playing, and both will sit out for rest Sunday. 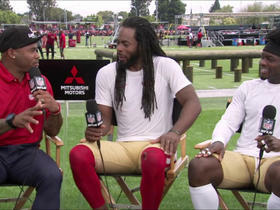 That gives the 49ers some compelling upside, even if their defense has struggled lately. Still, it's hard to project what will come out of the Rams' backups on Sunday, so consider the 49ers D/ST a risky start Sunday. FS Adrian Colbert (concussion) will play Sunday against the Jaguars. SS Eric Reid is battling a knee and rib injury ahead of Sunday's game against the Titans. 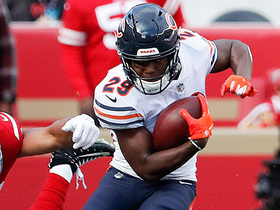 FS Albert Colbert is dealing with a thumb injury ahead of Sunday's game against the Texans. FS Adrian Colbert (thumb) was limited in Wednesday's practice and it's uncertain if he will play Sunday against the Bears. General manager John Lynch said FS Adrian Colbert (thumb) is a long shot to play Sunday against the Seahawks. DE Solomon Thomas (knee) won't play Sunday against the Giants. DE Solomon Thomas is ruled out for Sunday's game against the Cardinals. 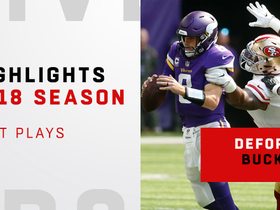 Check out San Francisco 49ers defensive tackle DeForest Buckner's best plays of the 2018 season. 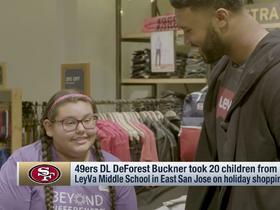 San Francisco 49ers defensive end DeForest Buckner took a group of middle schoolers in East San Jose on a holiday shopping spree.